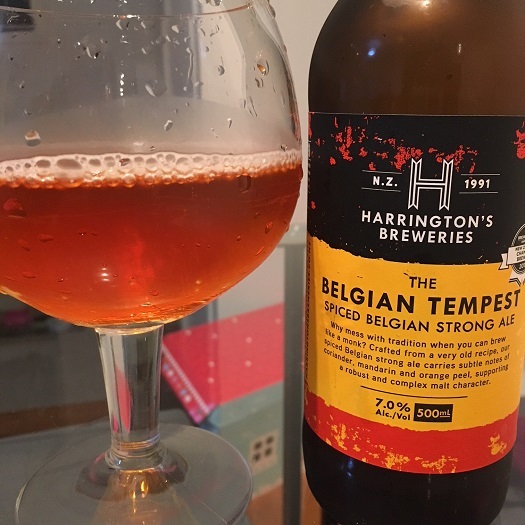 The weather was so dreadful last night that rather than go to Eden Park to watch the rugby, I shunned my Blues season tickets for my couch a bottle of Harrington’s ‘The Belgian Tempest’ spiced Belgian strong ale. Blurb on the bottle: Why mess with tradition when you can brew like a monk? Crafted from a very old recipe, our spiced Belgian strong ale carries subtle notes of coriander, mandarin and orange peel, supporting a robust and complex malt character. The review: I’ve been drinking a lot of APAs and IPAs lately, so this spiced Belgian strong ale feels like something completely different. Where are all the hops? Only joking. This beer is all about the subtleties of malts and yeast. Like the blurb on the bottle notes, Harrington’s ‘The Tempest’ does indeed carry notes of coriander, as well as pepper, marmalade, and alcohol (did I mention the 7% ABV?). It pours a deep amber, with little or no head to speak of. The verdict: I enjoyed Harrington’s spiced Belgian strong ale, and at just $5 for the 500ml bottle from my local Countdown, it represents exceptional value for money. But will I remember it in a week’s time? Unlikely. Beer/movie combination: While I was stuck inside most of yesterday I finally caught up with the Oscar-nominated film Lady Bird, which is a coming-of-age comedy-drama starring Saoirse Ronan and directed by Greta Gerwig. Check out more Harrington’s Breweries beer reviews.